On route to Southend with the family for Sunday lunch at the in-laws, and I made a quick detour off the A13 towards Pitsea to catch up with a few Waxwings - my first birds this winter (I've been holding out for some local ones - no joy yet!). 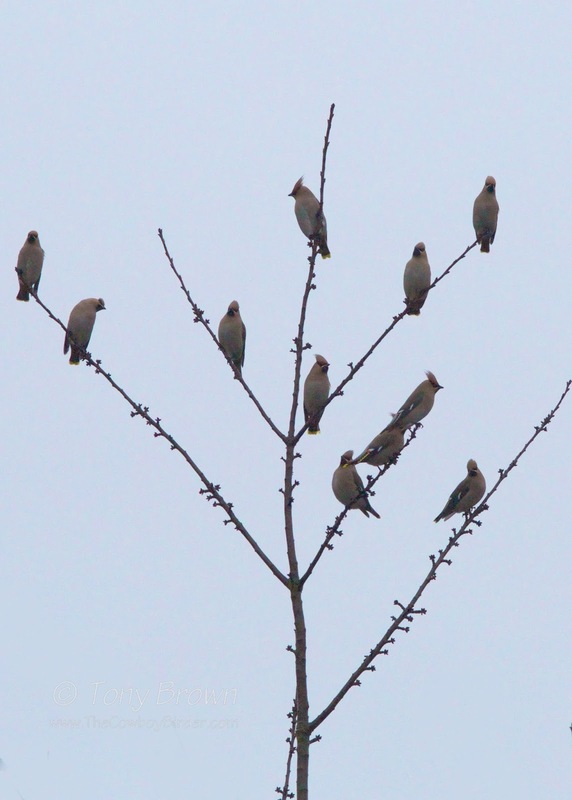 The Tesco's at Pitsea is a reliable site to catch up with Waxwings especially when the UK experiences winter invasions of these Scandinavian punks as I've seen them here on a couple of occasions in the past. The weather did me no favours as it was tipping down but fortunately it took me all of two minutes to locate the birds in the trees opposite the Go Outdoors store. With the rain continuing to fall I happily stayed in the dry of the car to view the birds, but I could still hear their distinctive soft trilling calls over the noise of the radio. Unfortunately in the short amount of time I had, the birds all kept there distance, sticking to the tops of the trees. I counted 31 birds in total, fewer numbers that had been reported recently so these birds are starting to disperse and looking at the diminishing berries on the trees the rest of them will soon be on their way - hopefully to a Woodford/Wanstead postcode.